What is history? History has to do with the study and knowledge of past events and occurrences. It is the task of those in t he present to research and make sense of what happened in the past, both good and bad, and discover what truths can be gleaned by those who live in the present. Understanding history is crucial and important for the wellbeing of individuals, communities and the nation. History helps shape our personal identity in a diverse world. History enables us to discover our own place in the stories of our families, communities, and nation. History enables us to learn the stories of the many individuals and groups that have come before us and shaped the world in which we live. The stories of tragedy and triumph creates in a person personal values that helps one to develop a proper philosophical approach to life and one’s relationship with others. 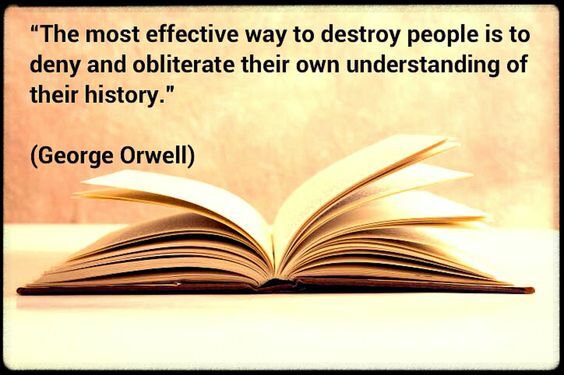 With that being said, for the life of me I cannot understand why so many people in the day and hour in which we live are freaking out over history and want to sanitize that which in history they don’t like; who think they can magically erase what actually took place. Yes, I know not all history is good, as history is filled with the ugly and the lovely; the horrid and the honorable; the dreadful and the delightful. But when we seek to whitewash or sanitize history we lose the valuable lessons history teaches us; we lose the events that shape and make us who we are as a nation and as an individual. History teaches us to rise above the horrific and be determined not to repeat those mistakes, and the honorable teaches to embrace the good and build upon it. Pretending the past didn’t take place will not undo it nor can we rewrite it to fit our fancy. To attempt to do so keeps us from building upon the mosaic of our heritage and adding to the kaleidoscope of colors that make up our personhood. When we seek to sterilize the past, we are eventually destined to repeat that which we pretend didn’t happen. As I look at my own family history my fifth great grandfather was sent on a ship from his homeland in England to the New World in 1720 to labor for seven years as an indentured servant for being a horse thief; my great, great grandmother was born illegitimate; my great grandfather was born illegitimate; my great, great, great grandmother had five children and never married; but no matter how I would like to go back and change their pasts I can’t. I also had a fifth great grandfather who honorably fought in the Revolutionary War; my great grandfather was a county commissioner and owned his own country store; and my grandfather was involved in county government, a Baptist deacon, and a well-respected man in his community. Now I can’t pick and choose my heritage, yet the sordid past of some of my ancestors and the honorable service of others all go into molding my personal heritage, of which I am most proud. ON WHAT DAY WAS CHRIST CRUCIFIED? DID JESUS REALLY RISE FROM THE DEAD? WHEN IT IS OK TO BE A FOOL! CHRIST “THE FIRSTBORN OF ALL CREATION” – WHAT DOES THAT MEAN? IS “EDUCATION” IMPORTANT WHEN PREACHING? WHAT ABOUT THIS THING CALLED SIN? WHAT DID JESUS GIVE UP WHEN HE BECAME A MAN? VOLTAIRE’S PREDICTION, HOME AND THE BIBLE SOCIETY - TRUTH OR MYTH? John 21:25 Look it Up! Thoughts on scripture, family, leadership, church and culture. Based on Psalm 119:72 -"Your words to me are greater than gold." Seeking to fulfill God's purpose for my life while raising my grandson with a husband working in Afghanistan.